The Philippines TUKLAS Innovation Labs has selected its final 40 disaster preparedness innovations, after receiving more than 260 proposals from all 17 regions of the Philippines. Each selected innovation team will be provided with up to 1 million pesos in seed capital, training, and mentorship to test their disaster preparedness innovations from March to November 2018. TUKLAS, which is short for Tungo sa Kahandaan ng Pilipinas, is a community-centered innovation project that aims to support local solutions on disaster risk reduction and management. The selected innovation teams come from different backgrounds, including high school students, women with disabilities, and indigenous people. Most of them got their disaster preparedness ideas from their experience during Super Typhoon Yolanda, the Marawi Siege, and recent disasters. The Philippines TUKLAS Innovation Labs is implemented by a consortium of four non-government organizations—Plan International, Action Against Hunger, CARE Philippines, and the Citizen’s Disaster Response Center. It is part of the Disaster and Emergency Preparedness Program (DEPP) Innovation Labs, a global network of labs funded by UK aid, and co-managed by Start and CDAC Networks. 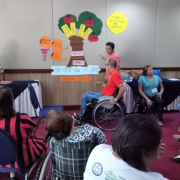 A2D Project-Research Group for Alternatives to Development, Inc. participated a 2-day Disability-Inclusive Development Workshop for Enhancing Inclusion of Persons with Disabilities in Developing Programs and Projects of NGOs. The workshop was held on May 9-10, 2017 at Dohera Hotel, Mandaue City, facilitated by Life Haven, Inc. in partnership with Arbeiter-Samariter-Bund. With the theme, “Nothing about us, without us,” the workshop highlighted the importance of the role of persons with disabilities as integral part to development. “New development projects will only be successful if these include persons with disabilities as integral to development, with the advancement of human rights as a key pillar.”, according to Dr, Benjamin “Jun” Bernandino, Executive Director of Life Haven, Inc. The workshop emphasized that the absence of persons with disabilities in the project cycle results to a significant part of the population not being able to benefit from development interventions. Dr. Leodinito Y. Canete, Chair and Officer-in-Charge Executive Director of A2D Project, committed to use lessons learned from the workshop to contribute to strengthening its ongoing advocacy on inclusive development. ENABLED Project staff, members of the management and Board of Trustees of A2D project attended the project. Participants from Fellowship for Organizing Endeavors, Inc. and representatives from Department of Social Welfare, Development Region VII and Cebu Disability-Inclusive Disaster Risk Reduction Network were also invited to the workshop. Life Haven, Inc., is a non-profit, non-government organization working towards empowering persons with disabilities to promote self-development. 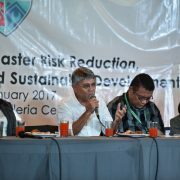 A2D Project-Research Group for Alternatives to Development, Inc. (A2D) hosted an Expo-Summit on Disaster Risk Reduction, Climate Change Adaptation and Sustainable Development Goals last January 20-22, 2017 at the Robinsons Galleria Cebu. 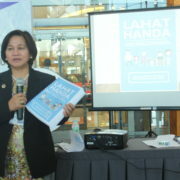 This event was organized in partnership with Disaster Risk Reduction Network Philippines (DRRNet Phils. ), Center for Disaster Preparedness (CDP), Provincial Government of Cebu and Robinsons Galleria. The two-day summit was attended by more than 1000 participants representing non-government organizations, people’s organizations, local government units, disabled people’s organizations, faith-based organizations, members of media and academe and students. One of the highlights of the summit was an Info Fair Exhibition in the Atrium of Robinson’s Galleria where civil society organizations showcased their good practices in disaster risk reduction and climate change adaptation initiatives as well as in building community resilience. It was also a platform for raising public awareness on disaster preparedness and sustainable development. The event also had two panel discussions. The first panel was about unpacking the Sendai Framework for Disaster Risk Reduction, Sustainable Development Goals and the Paris Climate Agreement. Then, it was followed by a panel of discussion on good practices in DRR-CCA-SGDs featuring small-island resilience, the purok system of San Francisco, Camotes, climate resiliency field school and the Philippine data revolution. The summit ended with a plenary discussion on “Towards Building a Roadmap for Achieving Disaster and Climate Resilience and Sustainable Development” presented by NEDA Undersecretary for Regional Development, Dr. Adoracion M. Navarro. Ms. Lorraine Dela Cruz, Executive Director of Center for Disaster Preparedness, emphasized, “The [summit was] an opportunity to discover and innovate the way programs and projects contribute to disaster risk reduction, climate change adaptation and sustainable development”. A2D Project and CDP are active members of DRRNet Philippines, a national network of 42 civil society organizations, communities, practitioners and advocates adhering to the Sendai Framework for Disaster Risk Reduction (SFDRR) and implementing community-based disaster risk reduction and management (CBDRRM). 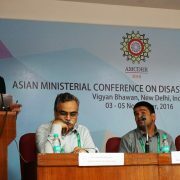 A2D Project participated in the recently concluded 7th Asian Ministerial Conference on Disaster Risk Reduction held in New Delhi, India last November 3-5, 2016. With the theme “Risk Sensitive Development for Community Resilience”, AMCDRR 2016 focused on collaboration among Asian countries for the implementation of the Sendai Framework for Disaster Risk Reduction (2015-2030) towards making the Asia-Pacific Region more resilient to disasters. Aloysius Canete, Executive Director of A2D Project, shared lessons and recommendations to increase collaboration of persons with disabilities/ Disabled People’s Organizations (DPOs) with government in local risk sensitive development organized by the Disability-inclusive DRR Network (DiDRRN). In his presentation, Canete highlighted the challenges encountered in working with government, civil society organizations, and disabled people’s organizations towards mainstreaming disability perspectives in disaster risk management and how A2D Project is exploring ways to address these challenges. “Persons with disabilities are often overlooked in disaster risk management (DRM) programs of the government. It is then very important to create an enabling environment through which government, civil society, and disabled people’s organizations can work together.” With this, Canete showcased the establishment of the Cebu Disability-inclusive DRR Network (Cebu DiDRRN) as a platform for such collaboration, facilitating partnership and dialogue among different stakeholders in the province of Cebu, in Central Philippines. Conducted roadshows in commemoration of the International Day for Disaster Risk Reduction (IDDR). “From this experience, we have shown how working collaboratively and partnering with government at different levels is a crucial component for advancing disability inclusion in DRR. Through this collaboration, for example, we have advocated for the integration of disability inclusion in developing local DRM budgets as well as for greater participation of persons with disabilities in DRM processes,” Canete added. It is hoped that the lessons from A2D Project’s initiatives in DiDRR can contribute to strengthening the ongoing advocacy for strengthening disability inclusion in DRR programming in the country and in the region. Over 3,000 participants attended the AMCDRR 2016 including ministers and senior government officials, bilateral and multilateral organizations, community-based organizations, technical experts, and private organizations from more than 40 countries. The major outcomes of the AMCDRR were the Asia Regional Plan for Implementation of the Sendai Framework for Disaster Risk Reduction, New Delhi declaration for strengthening political commitment in the region in DRR, as well as a series of action statements from various partners promoting an ‘all-of-society approach’ to building disaster resilience. A2D Project’s participation in the AMCDRR 2016 was supported by Arbeiter-Samariter-Bund (ASB), a German relief and social welfare organization engaged in a widerange of social service provision in Germany and abroad. Apart from Canete, the A2D Project delegation to the AMCDRR 2016 also included Ms. Marivic Codinera and Mr. Marvelous Jorda of Blind Association of Lapulapu City. The Canada Fund for Local Initiatives awards an 8-month grant to A2D Project to implement an initiative entitled “Women Action for Community Resilience through Promoting Gender-responsive Budgeting for DRM/CCA” (WOMENACT4DRM/CCA). This pioneering work aims to build capacities of selected at-risk coastal communities for gender-responsive budgeting in disaster risk management and climate change adaptation planning and programming. According to the Disaster Risk Reduction and Gender Consultant of A2D Project, Kaira Zoe Alburo-Canete, “while community-based disaster risk management has gained popularity in the Philippines, gender has remained a marginal consideration in DRM planning and strategizing.” Cañete further points out that while it has long been recognized that consulting with women often and continuously is essential in crafting effective development and disaster prevention initiatives, women’s contributions to risk reduction have been easily undermined due to their lack of meaningful participation in DRM processes. “Gender-responsive budgeting is an effective tool through which gender-aware climate change and disaster risk reduction measures can be put in place. 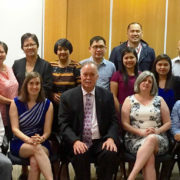 This project is unique as gender-responsive budgeting has not yet been fully explored or applied as a method specifically to facilitate efforts in building community resilience to disasters” Cañete added. One of the main results of the project is the development of a toolkit on community-based gender-responsive budgeting for DRM/CCA programming. This toolkit will be made available to local governments and government agencies, civil society organizations, and people’s associations in order to promote gender inclusion in local disaster risk reduction programs. 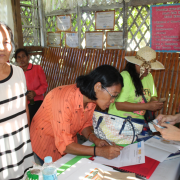 As pilot areas, the WOMENACT4DRM/CCA Project will be rolled out in barangays Guintaboan and Cuya in the Municipality of Ubay, Bohol. The Cebu Disability-Inclusive Disaster Risk Reduction Network (CDiDRRN) conducted a five-day training-of-trainers (TOT) on Lahat Handa (Inclusive Disaster Risk Reduction) in partnership with A2D Project—Research Group for Alternatives to Development Inc., Cebu Provincial Disaster Risk Reduction Management Office and Cebu Provincial Social Welfare and Development Office (PSWDO) on April 18-22, 2016.The training is organized through A2D’s ENABLED Project aimed at building the capacity of its members and partners towards disability-inclusion in disaster risk reduction in the Province of Cebu. A2D’s initiative is funded by Arbeiter Samariter Bund (ASB). The participants will form the first pool of trainers who will in turn train DRR stakeholders in local government units (LGUs) of Cebu province on inclusive DRR and disaster preparedness. The TOT was participated by more than 30 stakeholders or representatives from the civil society organizations, local government units and disabled people’s organizations (DPOs). Facilitated by representatives of Handicap International, CBM, National Council of Disability Affairs (NCDA) and Alyansa ng may Kapansanang Pinoy (AKAP Pinoy), the participants were trained using the Manual on Inclusive DRR called Lahat Handadeveloped by a Technical Working Group consisting of the Philippine Office of Civil Defense, NCDA, Handicap International and Center for Disaster Preparedness among others. The manual is a supplementary module to the Office of Civil Defense’s Basic Instructor’s Guide. This manual contains guidelines on inclusive early warning systems, tip sheets for persons with disabilities, and accessible evacuation centers, among others. Acknowledging the importance of accommodating the specific needs of persons most at risk to disaster, the first day established the link between disasters and the vulnerabilities of persons with disabilities, older persons, women and children. The legal bases of the community-based disaster management and inclusive community risk assessments were likewise revisited. These lectures are contained in the first module of the Lahat Handa Manual. The second and third modules were discussed on the second day. Participants drew up disability-inclusive plans and reviewed the roles and responsibilities of barangay (village) disaster management plans during the workshops that followed. Games were also used as a methodology in developing family preparedness plans, evacuation planning and prevention and prevention and mitigation procedures. In addition to this, participants were asked to review the accessibility of the training venue. Essential feedback and recommendations were given by persons with disability in attendance. Mark Joseph Signe of Deaf Disaster Assistance Team-Disaster Risk Reduction (DDAT-DRR) noted that blinking lights should be installed inside hotel rooms since loud knocks and telephone rings would not suffice for deaf persons in cases of emergency. Additional comments include trip and slip hazards for persons on wheelchair and those with physical difficulty on the shiny floors of the cafeteria. The facilitators assured that the feedback would be informed to the hotel to address. The fifth and final day of the training centered on Module 4 consisting of basic concepts of first aid, proper handling of human corpse and basic survival tips. To cap the training workshop, individual participants were tested on their platform skills. Using the Lahat Handa manual they were each asked to choose a topic and simulate an inclusive facilitation; then, their performance were reviewed by the resource speakers. A2D Project-Research Group for Alternatives to Development, Inc., in partnership with Arbeiter-Samariter-Bund (ASB) and Aktion Deutschland Hilft (ADH) formally launched a disability-inclusive disaster risk reduction (DiDRR) initiative in barangays Libjo and Somosa in Tabogon, Cebu Province on 1 June 2015. The project is called “Post-Haiyan: Enhancing Resilience Through Disability Inclusive Community-based Disaster Risk Management in Tabogon, Cebu, Philippines”. The overall aim of the project is to promote a disability-inclusive community-based disaster risk management (Di-CBDRM) using the Purok System. The Purok System has received an international recognition for being an effective model in building resilient communities. The project seeks to achieve the following outcomes: (1) establishedPurok System in partner communities; (2) improved capacities of communities in enhancing local disaster preparedness and prevention efforts; (3) increased participation of at-risk groups in local governance structures and processes to facilitate inclusion and accessibility and; (4) shared lessons learned on good DiDRR practices in the Philippines. According to German watch’s Global Climate Risk Index 2015, the Philippines ranks 5th in the list of countries most affected by extreme weather events during the year 2013. The stories from the communities that have experienced the effects of super typhoonHaiyan (local name “Yolanda”) are testimonies to this event. While the impact of Haiyan has affected millions of lives and properties, its effects are even greater for at-risks groups including persons living with disabilities. It is in this context that A2D Project seeks to contribute to improving DRRM in communities by rendering the entire DRR process to be disability-inclusive. According to Aloysius Cañete, the Executive Director of A2D Project, “This project, being the first of its kind, is going to be a challenge for us. 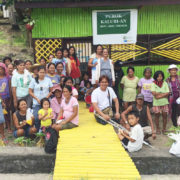 But we shall draw lessons from this experience with what the pilot communities would be able to achieve using the Purok System – one that has been tested and proven effective in similar high-risk communities”. This project is funded by ASB through its Philippine Community Resilience Programme. This programme aims to strengthen the resilience of communities affected by typhoon Haiyan through inclusive community-based community programming. ASB is a German relief and social-welfare organisation engaged in a wide range of social service provision in Germany and abroad. Since its foundation in 1888, ASB has represented continuity and reliability founded on non-political, non-religious and non-sectarian principles. Through an integrated approach ASB provides effective worldwide assistance and supports the establishment of locally developed solutions. ASB’s funding partner is Germany’s Relief Coalition, Aktion Deutschland Hilft (ADH), a federation of German relief organisations that provide rapid and effective aid in the case of major catastrophes and emergency situations. UNISDR (2014). Living with disability and disasters: UNISDR 2013 Survey on Living with Disabilities and Disasters-Key Findings. Cebu City, Philippines – In line with its advocacy of promoting disaster risk reduction and climate change adaptation in vulnerable communities, A2D Project – Research Group for Alternatives to Development Inc. recently launched a project funded by the United Nations Children’s Fund (UNICEF) entitled “Strengthening Capacities for a Child-centered Disaster Risk Reduction in the Municipalities of Bantayan and Daanbantayan in the Aftermath of Haiyan” or S3CDRRM. S3CDRRM is a community-based initiative that recognizes the important role of children in the furtherance of risk reduction efforts. In particular, the project seeks to capacitate children and other community and municipal DRRM actors in advancing child-centered disaster risk reduction and management (CC-DRRM) at the municipal and barangay levels. In 12 months, S3CDRRM will undertake institutional capacity development on Child-Centered DRRM for the Local Government Units of Bantayan and Daanbantayan, two of the hardest hit municipalities during the onslaught of super typhoon Haiyan. In addition, In order to establish good practices in community-based child-centered DRRM, the project operates in two pilot barangays namely, Barangay Patao in Bantayan and Barangay Poblacion in Daan Bantayan. Other activities include the advocacy for the promotion of safer schools and the mobilization of informal community structures particularly youth volunteers for disaster risk reduction. Since the project’s commencement in September 2014, the project has not only engaged different stakeholders in conducting trainings and planning, it has also facilitated building relationships with other international and local NGOs who are also working in these Haiyan-affected areas. From municipal planning workshops to basic DRR trainings to children’s dialogues to school safety audits done by children, the project hopes to slowly contribute to the dream of achieving disaster resilience. This initiative is undertaken in partnership with Young Heroes for Cebu and Bisdak Pride.